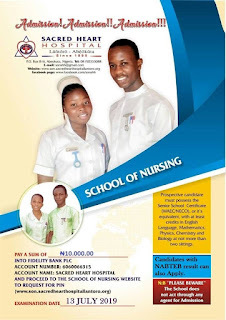 School of Nursing, Sacred Heart Hospital, Lantoro, Abeokuta School of Nursing Admission Form, Requirements, Application Guidelines, Entrance Examination and Interview Date for 2019/2020 Academic Session. This is to inform the General Public and all interested applicants that the sales of form of the School of Nursing, Sacred Heart Hospital, Lantoro, Abeokuta commenced on February 1st, 2019. Candidates who wish to apply must make sure they meet up the available and necessary admission requirements of the school before application. The School of Nursing, Sacred Heart Hospital is a private (Missionary) Institution with the mandate of giving qualitative training to young health professionals in Nursing. It is owned by the Catholic Diocese of Abeokuta, under the Proprietorship of Most Rev'd. Dr. Peter Olukayode Odetoyinbo. 1. Prospective candidates must possess the Senior Secondary School Certificate (eg. WAEC or NECO)with at least FIVE credits including English Language, Mathematics, Biology, Chemistry and Physics at not more than two sittings. 2. Candidates with NABTEB Results can also apply. Interested applicants for 2018/2019 Admission into the School of Nursing, Sacred Heart Hospital Lantoro should make a payment of Ten Thousand Naira Only (#10,000.00) following ONE of the payment options outlined below. Please note that PIN requests for Option 2 above would be treated within 24hrs (Working Days Only) from the time of request. Sales of Pins and Online Registration date of the School of Nursing, Sacred Heart Hospital for the 2018/2019 academic session will end on Friday, 12th July 2019.